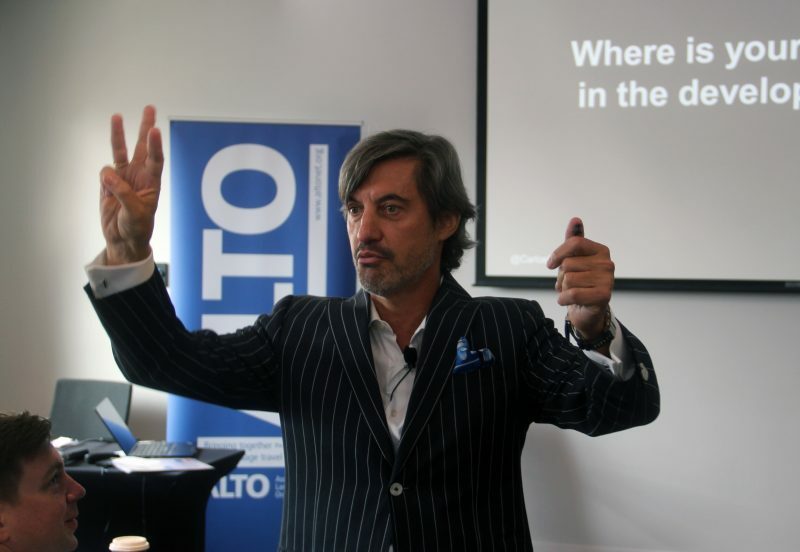 ALTO members who joined us in Madrid for our 2017 Annual Conference will no doubt remember charismatic speaker Carlos Escario (be sure to read our post-event article The 5 Terrains of Business Growth). We were pleased to welcome him back to our latest professional development and networking event in London, England at the start of September, where delegates were forced to think hard about their own leadership qualities and those of key senior colleagues in their team. In his engaging morning session Escario outlined four distinct styles of leader. “Are you a Sovereign, Warrior, Lover or Magician?” he asked, explaining how each type of leader operates. Using an axis similar to Myers-Briggs techniques, leadership style was defined based on extroversion or introversion and rational or creative tendencies. The Warrior (in red) looks for control and values results but can be impatient and insensitive. The Sovereign (in blue) looks for accuracy and values precision but can be stubborn or overly critical. The Magician (in yellow) looks for recognition and is a visionary but can be unfocused or neglect details. The Lover (in green) wants to be accepted and values team dynamics but can be too sensitive, submissive or slow. Red concentrates on ‘what’ and ‘when’ – more short-term focused and prioritising effectiveness over efficiency. Blue narrows in on the ‘how’ and the most efficient path. Yellow on ‘why’ and ‘what’ – a long-term plan. It’s important for each key person in your organisation to understand what type of leader he or she is, and also for senior management teams to have a blend of types at the top of a business. “Leadership is about making others better because of your presence,” counselled Escario, forcing delegates to consider how they can ensure teams flourish together under their leadership. He challenged those in the room to become a “legendary leader”. If you “become more in order to give more” back to society in some way, then that is the hallmark of a legendary leader and what sets them apart from others, Escario explained. Moving on from focusing on individual leadership qualities, the group also considered the natural life-cycle of a business. Easy-to-grasp analogies of business evolution were shared, with members forced to consider where their business sat on the cycle, from infancy to adolescence, prime (optimum moment), stable, aristocracy and then declining into bureaucracy and death. As businesses become more organised and larger, it becomes more selective about what products or services it delivers for its clients. This can be a difficult stage for the owner or founder, who might need to start saying ‘no’ more than they used to. Other growing pains as the entrepreneurial founders involve new senior management occur but it’s not all bad, noted Escario; businesses should evolve to have real clarity around their proposition, vision and culture. The challenges start when a well-organised and structured business stops innovating and totters over into a staid, bureaucratic existence. As innovation and revenue declines, senior management might make cost-cutting decisions when in fact, this is the time when they need to inject creativity and funding in order to halt this downward direction, he explained, using examples of well known companies such as Apple. Carlos clearly wowed the audience. Based on the feedback forms, an impressive 97% gave excellent or very good for his session. Only Verne Harnish has received such a fantastic score from ALTO attendees. We urge you to login to the members’ area and watch the presentation videos if you missed the London event. Carlos’s slides and handouts also available on the same page. Can You Tell Your Story in Just 6 Words?